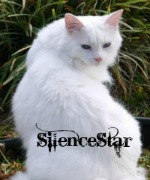 Name: Fallenstar - Rank & Clan: Leader of Foxclan - Gender: She-cat - Mate: None. - Kits: None. Fallenshadow(OOC) - LINK HERE - Joining Fallenshadow. A Star Has Fallen Into Starclan's Midst - LINK HERE - Fallenshadow becomes Fallenstar. Starting Out - LINK HERE- Fallenstar returns to her clan a leader. The Huntress, The Hunter, and the prey - LINK HERE - Fallenstar hunts with Riverfoot, her first hunt since becoming a leader. Name: Fadedpaw - Rank & Clan: Apprentice of Crowclan - Gender: Tom-cat - Mate: None. - Kits: None. Fadedpaw of Crowclan(OOC) - LINK HERE - Joining Fadedpaw. A New Beginning - LINK HERE - INFO HERE.